Time has been flying by and I can’t believe I’m almost through pregnancy and we get to meet baby Logan any day now! Before life gets too crazy I wanted to take the time to share with you all my Third Trimester Update. Many women say it’s one of the hardest trimesters, but I honestly found that my body was getting used to things and all and all it wasn’t that bad. I could just be lucky, but I’ve honestly found it to be the best trimester for me, and I hope when you’re there you have a similar experience as me. My ever so favourite heartburn continued strong from the second trimester into the third. It got quite bad where it would keep me up until 2:00 / 3:00 am so I finally caved and took some Zantac. I definitely should have done that sooner, it was a lifesaver! From everything I’ve looked into getting stretch marks seems to be a combination of genetics, keeping things moisturized, and staying hydrated. I’ve been really lucky in the genetics department and have always kept myself well hydrated, you may have been able to tell with all of my drink water posts, and I contribute my minimal stretch marks to using Bio Oil twice a day since the beginning of the second trimester. Up until roughly month 7 I only moisturized my belly and I started seeing a few stretch marks on my breasts. I started oiling them up as well, but it was a bit late and they definitely have stretch marks, albeit less than most women get. So if you’re worried about stretch marks, and are someone that has been lucky with genetics and has never had stretch marks previously, I highly recommend oiling up your tummy, breasts, and thighs 1 – 2 times a day from month 3 or 4 onward. I think if I oiled up more than just my belly I probably wouldn’t have any stretch marks because I don’t have a single one on my tummy and I’m almost full term now. Right at the transition from second to the third trimester I started sleeping less and less. I think it’s natures way of getting my body used to not sleeping much. Every night I wake up anywhere between 3 – 5+ times which includes 1 – 2 times that I actually have to get up to pee. The loss of sleep was hard at first, but I found my body got used to it. I did find that for the 8th and 9th month my body needed more sleep. Many women tend to have naps midday or after work, but I found that a nap would throw off my evening, and luckily I work from home so I started allowing myself to sleep as much as possible. Now in the final few weeks I find that I need 10/11 hours of sleep which does include waking up constantly, but with that amount of sleep I’m generally able to get through the day and don’t get too tired until the evening. If I don’t get that much sleep I start to get super tired between 3:00 – 5:00 pm. 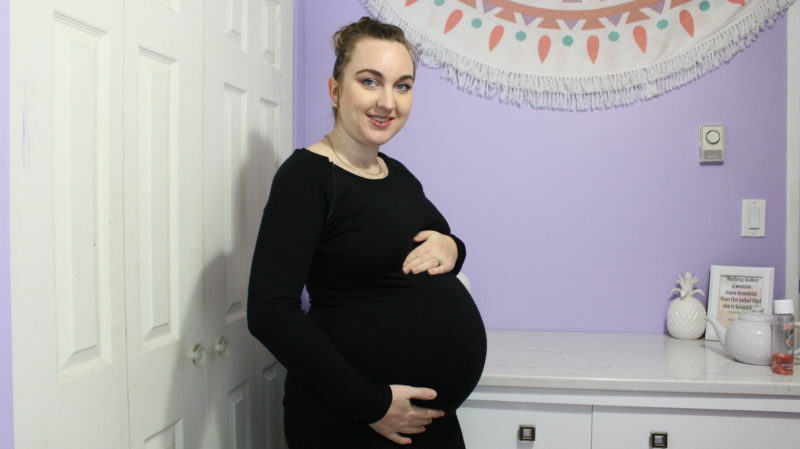 The beginning of the third trimester was great for not needing to constantly pee, but as soon as the baby dropped it meant extra pressure on the bladder, and every time I stood up I felt like I needed to pee. Often times I knew it was my body playing a trick on me and I could hold it, but it was still quite annoying and if I hadn’t peed in a while I’d end up having to head to the bathroom. Many women talk about the dribble or leaking when they laugh or sneeze. This all relates to your pelvic floor. Luckily my pelvic floor has been in pretty good shape and I haven’t dealt with this. If you are finding you are experiencing these things, it is totally normal, but it’s a sign that you should probably speak with a pelvic floor health professional who can help you tighten things up after birth. I contribute some of my pelvic floor health to incorporating squats and bridges that include kegals into my workout routines, as well as not jumping as my belly grew. The third trimester has brought on some major nesting tendencies. With some help from my Mom, I got Logan’s nursery all painted and decorated, which I’m super excited about and went totally overboard completing all of it over a weekend. I also found that whenever I would start to clean it would turn into a bigger and bigger project. Just one example is one day I went to vacuum. Then I noticed the vacuum smelled so I took it all apart and wiped it down inside and out. Then I noticed that the corner we keep our vacuum was kind of dirty so I proceeded to wipe down all of the walls in the kitchen and mop the floors including moving our little island out of the way. Another thing I’ve loved about the third trimester is that I’m barely ever cold when I used to ALWAYS be cold. It’s definitely timed out right by being in the third trimester over winter, I’m sure I wouldn’t be too happy about it if it was over the summer, but it’s been really nice having baby Logan as my personal heater to keep me warm during the super cold days. This isn’t really a pregnancy experience, but something that I really wanted to recommend. I got some beautiful maternity photos done and I’m so so happy that I did. Your body is only going to be like this once or maybe a few times in your life and I think it’s so important to capture those moments. If traditional professional maternity photos are out of your budget there are definitely other options. Luckily through the blog, I have a great photographer, Tim West, that I work with and was very happy to have him capture the images I was hoping for, but you could also have a friend take some photos too. Here in Victoria, there’s an awesome maternity gown rental business, Bump Envy Rentals, that has an awesome selection of gowns to rent for a very affordable price. Don’t let your budget get in the way, you can get creative and make sure you are able to get some great photos to treasure forever. Hang in there pretty mama! The end of pregnancy can be a real struggle, I felt like I was reliving the end of my own when reading your post. Nesting IS SO REAL! Your maternity pictures are gorgeous, THAT DRESS!! Its almost over! I remember the pain of going through my third trimester! Embrace the journey and thank you for sharing! Thanks Brandi, luckily I’ve been very lucky with a smooth third trimester. Congrats on the little one!! The nursery looks super cute! I hope you enjoy this last little bit of pregnancy you have left!!!!! Thank you 🙂 I’m definitely enjoying these last moments my husband and I have as a twosome, while at the same time very ready to meet the little one!